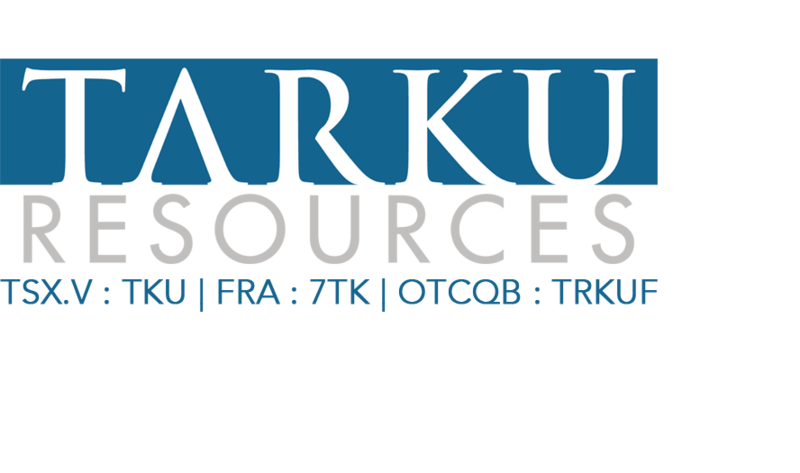 Cranbrook, BC, June 17, 2015: Tarku Resources Ltd. (TSX-V: TKU)("Tarku") announces that an extension has been granted by the TSX.V on the current non-brokered private placement offering (the "Offering"). The closing date will be July 4th. Tarku intends to issue up to approximately 6,000,000 Units to raise gross proceeds of up to $500,000. On June 3, 2015 Tarku closed the first tranche of the private placement for a total of $219,450. 671,667 flow-through units (the "FT Units") at a price of $0.09 per FT Unit have been issued for gross proceeds of $60,450 and 1,987,500 non flow-through units (the “NFT Units”) at a price of $0.08 per NFT Unit have been issued for gross proceeds of $159,000 (the "Offering"). (see press release TKU-PR June 3, 2015). newly constructed Route 167 Extension, a 4-season road providing direct access to the region. The property is also along strike and directly adjacent to the past-producing Eastmain Mine of Eastmain’s Ruby Hill project as well as directly south of their Lac Lessard Property. Eastmain plans a work program of $1 million and $500k respectively on those properties which will include an extensive drill program at each (PR- eastmain.com January 27). The technical information in this news release has been reviewed by Antoine Cloutier, P.Geo, a qualified person as defined by National Instrument 43-101.
manner described. Forward-looking statements involve various risks and uncertainties. There can be no assurance that such statements will prove to be accurate, and actual results and future events could differ materially from those anticipated in such statements. Important factors that could cause actual results to differ materially from TKU's expectations include the uncertainties involving the need for additional financing to explore and develop properties and availability of financing in the debt and capital markets; uncertainties involved in the interpretation of drilling results and geological testing and the estimation of reserves and resources; the need for cooperation of government agencies and First Nations groups in the exploration, and development of properties; and the need to obtain permits and governmental approval. TKU's forward looking statements reflect the beliefs, opinions and projections of management on the date the statements are made. TKU assumes no obligation to update the forward looking statements if management's beliefs, opinions, projections, or other factors should change.